Windsor Marquees offers the highest standards in marquee hire in the Bristol and Avon areas, priding ourselves on personal service, care and attention to detail. We aim to make your event a perfect and successful event. We specialise in marquees and accessories hiring and our dedicated staff are here to ensure you can relax and enjoy your day, whatever the occasion within Bristol and Avon and its surroundings. Using Windsor Marquees for your Bristol Marquee Hire needs makes perfect sense, as we have the experience, knowledge and skills when it comes to marquee hire Bristol and making sure that your event is perfect. Bristol is a modern and vibrant city with hundreds of well known shops, cafes, bars, restaurants and local amenities, you will never be bored. It is also a very busy business area, with local and national companies and firms having offices and factories in the area. On the other side of this, Bristol is also an historic maritime port, so maintains an element of history and offers a lot for a resident or visitor, there really is so much to do. Bristol has plenty to offer for the party animal, with many clubs and bar and also many well known restaurants to have a good meal in. 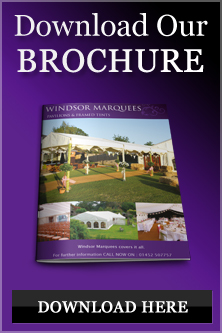 Windsor Marquees have been hiring marquees in the Bristol And Avon area for a few years, serving businesses, leisure facilities, accommodation and entertainment venues with a wide range of marquee and canopy hire. We can cater for any type of marquee hire requirement in the area, from 50 people to 500, so if you need a marquee to hire in the Bristol area, please do contact us for a free quote. We are specialists when it comes to marquee hire Bristol, so make sure that you get a quote from us when you start to think about your marquee hire requirements for your big day.